Save money every day! With a tip a day from America's Family Financial Expert®, readers reap practical money-saving tips that can be implemented right now! This purse-sized guide shows families how to save money on everything from groceries to vacations, life insurance to investments, and clothing to housing. Ellie understands the need to save - she is the mom of seven and has lived to tell about it! Easy-to-follow tips are divided into "need" areas. A coupon in the back of the book gets the reader jump-started. I loved this book.There are so many great tips to saving money in this book that I just wanted to read each and every one of them slowly and let it sink it so I remembered that tip and put it to good practise.Being the thrifty person I am, alot are second nature to me, but I still was able to find some new ones and enjoyed reading about saving, in Ellie's own words. We would like to give away one of these books to 2 lucky winners from Canada or the USA.A random draw will be made by Random.org on April 16, 2011 from all entries recieved. Please enter your email address in the comment section. I would love the chance to win this! Seriously, I could use that book. This looks like an excellent read! 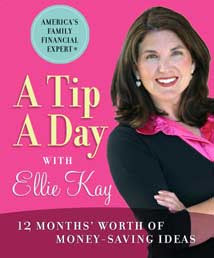 I would love to read A Tip a Day With Ellie Kay :) *Thanks* for the giveaway! Sure would like to win this one. I am a subscriber. Sounds like a good book. bucksomeboomer at gmail dot com. Hope to win - thanks for hosting!